Yesterday saw the WBA announce the date of the upcoming WBA Super Flyweight title fight. The bout, which will pit interim champion Denkaosen Kaovichit (62-3-1, 26) of Thailand against former champion Kohei Kono (28-8, 11) will take place on March 26th in Tokyo. For Kaovichit this will be his first fight since September when he over-came former 2-time champion Nobuo Nashiro via a narrow split decision for the interim title. Aged 37 Kaovichit is certainly a veteran of the sport though and was first a world champion back in December 2008. With his age and ring rust he will be seen as the under-dog though does have a 2-1-1 record in world title fights in Japan with wins coming against Daiki Kameda and Hiroyuki Hisataka. At the moment no other bouts from the card have been announced, though we would expect several Japanese v Thai bouts for the undercard. There are few families in world boxing that are as controversial as the Kameda brother's. Sadly the trio don't tend to help themselves that often and instead they seem to just make things worse. 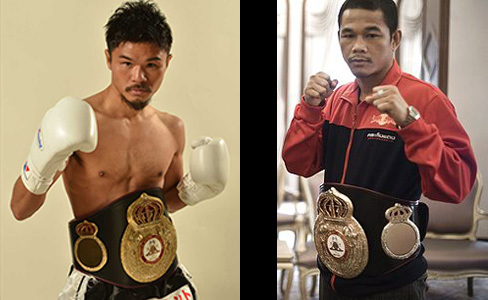 The latest faux pas by the Kameda's has seen Koki Kameda give up his WBA "regular" Bantamweight title rather than face WBA "super" champion Anselmo Moreno. A move that is being met be derision by pretty much everyone in boxing and will go down as one of the clearest "ducks" in recent boxing history. In fact, you may well need to go back to Riddick Bowe tossing a belt into a bin to find a more clear example of ducking than this. The Kameda-Moreno bout was set to go to purse bids on December 10th. Instead Koki has vacated the title and asked the WBA to rank him at Super Flyweight. A move we called way back in September (Koki Kameda v Anselmo Moreno-Not yet, if ever). What changed between September and now is the state of the WBA Super Flyweight title. Back then it was held by Liborio Solis. Of course this past week saw Solis being stripped of the title due to a failure to make the 115lb limit prior to his bout with Koki's brother Daiki. With Daiki failing to win that contest the title has remained vacant. You can bet your bottom dollar that Koki is eying up that belt as we speak. Whilst the avoidance of Moreno is a clear duck, and the puns such as "Coward Kameda" and "Quacky Kameda" are floating around the net, Koki himself will point to history. If he can claim a world title at 115lbs he would become the first ever Japanese fighter to be a 4-weight world champion. And yes, we know that would really rub salt in the wounds of those who dislike Koki. Sadly we can't help but say "told you saw", as we predicted this several times over the past few months, most recently after Daiki's fight with Solis. Saying that, we do think it'd be hilarious if the WBA told Koki to earn a ranking at 115lbs rather than just be granted one. It'd be nice to see one of the organisations finally sticking up to the Kameda's, though it would be rather unlikely.